After Nari Ward took home the Vilcek Prize in April, fans on the East Coast had ample opportunity to see his work in person. Over the summer, the Jamaican-born artist had three solo shows on view: two in New York and one in Boston. Socrates Sculpture Garden in Long Island City, New York, hosted Nari Ward: G.O.A.T., again, a public art exhibition of 26 sculptures installed in a five-acre riverside park in Queens. The show juxtaposes Nari's characteristic balance of wit and social politics, and was covered by major publications including the New York Times, The New Yorker, and Hyperallergic. Chelsea-based art gallery Lehmann Maupin concurrently hosted Till, Lit, another exhibition of Nari's work comprising a series of mixed-media paintings, sculptures, and installations that examine the ways value is assigned throughout society. Finally, a mid-career retrospective, Nari Ward: Sun Splashed, took over the exhibition space at the Institute of Contemporary Art, Boston. 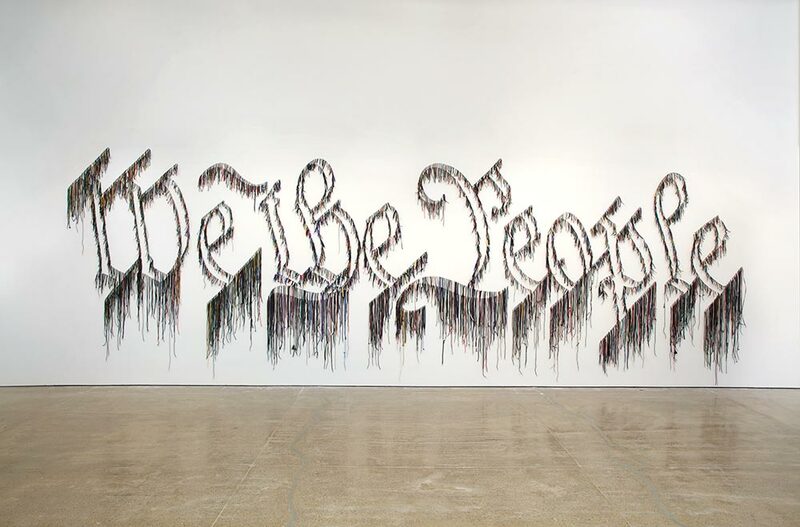 The show, which was originally organized by curator Diana Nawi for the Pérez Art Museum in Miami, was the largest survey of Nari's work ever assembled, and featured many of his most well-known pieces, including “We the People." The recipients of our Vilcek Prizes aren’t just the best immigrant scientists—they are among the best scientists in the world, period. German-born molecular biologist Peter Walter was named a recipient of the 2018 Breakthrough Prize in Life Sciences for his research into how cells synthesize and use proteins. He is the fourth Vilcek Prizewinner to receive the $3 million award, placing him in the distinguished company of Lebanese-born physician and neuroscientist Huda Zoghbi, Russian-born biochemist Alexander Varshavsky, and Dutch-born cell biologist Titia de Lange. Taiwanese-born Creative Promise Prizewinner Howard Chang also received a major contribution to his lab this year when he was named an Outstanding Investigator by the National Cancer Institute. The investigators each receive up to $600,000 annually for seven years to pursue a research project of unusual potential. In Howard's case, that means studying the role a class of genes called long noncoding RNA play in human cancers. Several pieces from the Vilcek Foundation’s American Modernism collection left home to join exhibitions across town and across the globe. 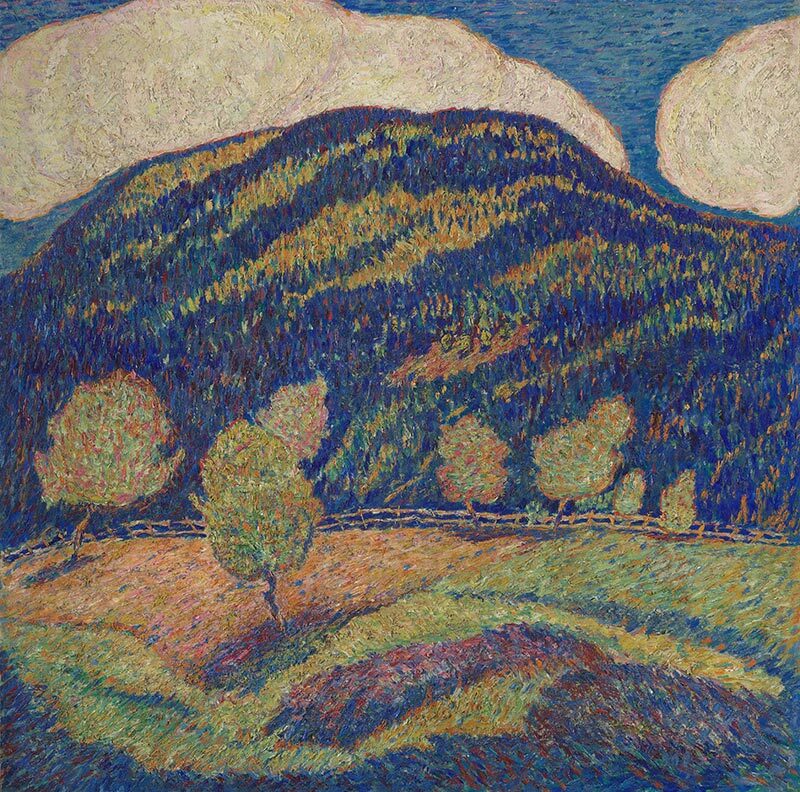 "Silence of High Noon - Midsummer," Oil on canvas, c. 1907-08. The foundation also contributed works to two exhibitions focusing on Georgia O’Keeffe. “In the Patio IX” was displayed at the Brooklyn Museum and the Reynolda House Museum in North Carolina as a part of Georgia O’Keeffe: Living Modern. The exhibition explored how O'Keeffe crafted her persona through her clothing, portraits, and paintings to become the first celebrity artist. The striking landscape, “Black Place II,” continued traveling as part of an international retrospective of O’Keeffe’s work and made stops in Vienna and Toronto before returning home. Another painting by O'Keeffe, as well as works by Andrew Dasburg and Arthur Dove, traveled to the High Museum in Atlanta for Cross Country: The Power of Place in American Art. And “Ships Rigging (Coordinates II),” by Stuart Davis, graced the walls of the National Gallery of Art in Washington, DC, before heading to the Crystal Bridges Museum of American Art in Arkansas, as part of Stuart Davis: In Full Swing. To stay up to date on which pieces from our collection are currently on view, check out the “Artworks on Loan” section on our website. A year after winning the Vilcek Prize in Theatre, Blanka Zizka, the Czech-born artistic director of Philadelphia’s Wilma Theater, made her debut as a playwright with Adapt! The dreamlike musical was based on Blanka’s experiences immigrating to America from Czechoslovakia in 1977, and included music ranging from traditional folkloric songs to Czech protest ballads to late-20th-century pop. English-born Creative Promise Prizewinner Sarah Benson staged two critically acclaimed productions this year. In April, she directed the debut of Richard Maxwell's Samara (a Soho Rep production performed at A.R.T./New York Theatre), a Western fable set to an original soundtrack by country-rock musician Steve Earle that was named a New York Times "Critics' Pick. Later in the year, she created another success with In the Blood (Signature Theatre), a powerful play by Jackie Sibblies Drury that reinterprets Nathaniel Hawthorne’s classic novel The Scarlet Letter, tackling issues of race and gender that are as timely today as when the play was first performed in 1999. Desdemona Chiang had a prolific year, directing five shows on two coasts. The Taiwanese-born Creative Promise Prizewinner directed Smart People (Long Wharf Theatre) in New Haven,Connecticut, before heading to Berkeley to direct an adaptation of As You Like It for Cal Shakes, and then closed the year with The World of Extreme Happiness (Seattle Public Theatre), It Can't Happen Here (Cornish College of the Arts), and Building the Wall (Azeotrope) in her home town of Seattle. Finally, Yi Zhao continued his streak as one of the world's best emerging lighting designers. In 2017, he teamed up with fellow Creative Promise Prizewinner Sarah Benson to set the stage for In the Blood and also lit The Christians (Dallas Theater Center), Assassins (Yale Reparatory Theatre), The Bluest Eyes (Guthrie Theater), Pipeline (Lincoln Center Theater), Close Music for Bodies (Fringe Art Festival), and Cela Nous Concerne Tous (Centre Chorographique National—Ballet de Lorraine). 2017 was a tumultuous year for immigration policy in the United States, with several controversial restrictions issued by the new administration. As former refugees and green card holders, our founders Jan and Marica Vilcek shared their thoughts on these policies; you can read quotes from below, or find their full statements on our website. 1. Spanish-born chef and Vilcek Prizewinner José Andrés organized relief efforts that delivered 2.2 million meals in Puerto Rico after Hurricane Maria. 2. UK-born neuroscientist Thomas Jessell, recipient of the 2013 Vilcek Prize in Biomedical Science, and his colleague, Rudy Behnia, break down the complex physiological processes behind Rafael Nadal’s superhuman reflexes. 3. Iranian-born Creative Promise Prizewinner Pardis Sabeti led a study that tracked the stealthy spread of Zika in the Americas. 4. Think your family immigrated to the US legally? Immigration historian says don’t be so sure. 5. Our founder Jan Vilcek speaks about his life and research on the Nature Biotechnology's First Rounders podcast. 6. The selections from our summer reading list are just as good next to a fire as they are on the beach—check them out to find a great new book. 7. Nonprofit Upwardly Global discusses the organization’s efforts to help college-educated immigrants navigate the path to employment with NPR. 8. Google programmer Amit Sood consulted UK-born Vilcek Prizewinner Andrew Bolton to create We Wear Culture, a new website that explores fashion history through the museum collections. 9. Vilcek Prizewinner Christo, originally from Bulgaria, protested Donald Trump by not making art.